After much speculation prior to the event, it was very pleasing that the first of the biannual Cold War Jets Open Days was so well-attended. 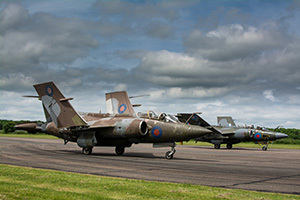 The day-to-day business of automotive testing and storage has very much dominated Bruntingthorpe proving ground of late. Fortunately, the Walton family were able to overcome the logistical difficulties of moving thousands of cars to allow the event to take place. The public rewarded these efforts by ensuring that the event was well attended. 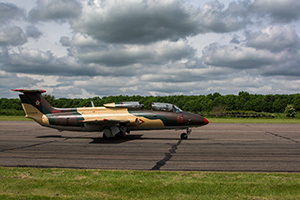 Those of you already familiar with the Cold War Jets Museum at Bruntingthorpe will be well aware of the large array of classic aircraft housed at the venue, mostly kept in ground-running condition. 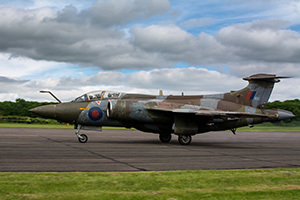 Amongst the collection are many legends of the British aviation industry that can no longer be seen running anywhere else in the UK such as the Handley Page Victor, Blackburn Buccaneer and English Electric Lightning. There are numerous static aircraft around the airfield, some of which are currently being restored with the intention of performing fast taxi’s in the future. The newly painted Avro Shakleton was looking very smart and the Super Guppy is always worth a look. The later, along with some of the other larger exhibits was open for boarding for a small fee. 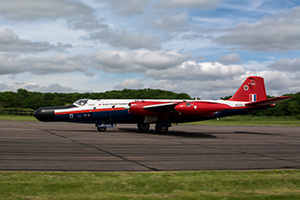 Following the unfortunate wheels up landing of the world’s only flying De Havilland Sea Vixen the day before, it was no surprise to see Bruntingthropes’ own example receiving a lot of attention. The restoration of which is going well and we look forward to seeing this run in good time. 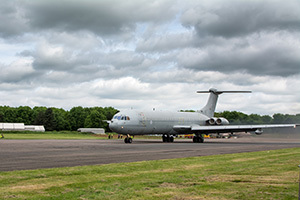 The first fast taxi of the day was the Vickers VC10 which zipped down the runway loud and proud shortly after an impeccably observed two minute silence in memory of the victims of the Manchester terror attack. 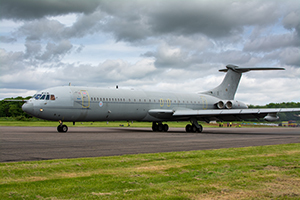 The Bruntingthrope VC10 ( ZD241) was the last of its type to fly and is still seen in its RAF tanker livery. The smell of burning jet fuel, a trail of smoke and vibrations that triggered numerous car alarms certainly started the show with a bang. This was then closely followed by two Blackburn Buccaneers which performed a slow figure of eight down the runway providing great opportunities for photographers. 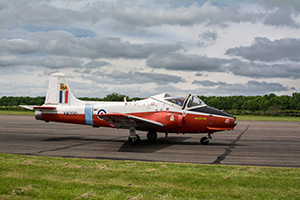 Although the two taxing Buccaneers were in RAF colours, the demonstration of their folding wings and arrestor hooks echoed the naval origins of this superb aircraft. 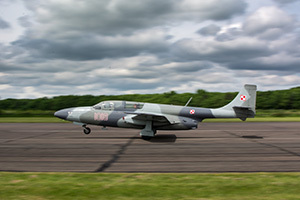 The high-speed simulated take off of these two aircraft was one of the highlights of the day. 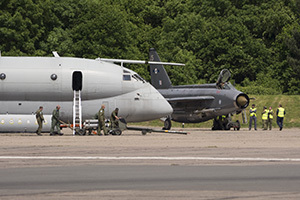 A third Buccaneer was also on static display in naval markings, it is hoped that this will soon be ready to join the others in a fast taxi which will really enhance the spectacle. Sadly, the pace of the day slowed a little as the complexity and logistics of maintaining these aging jets became apparent. There was a small gap in the proceedings as the De Havilland Comet and former RAF test bed ‘Canopus’ was unserviceable. 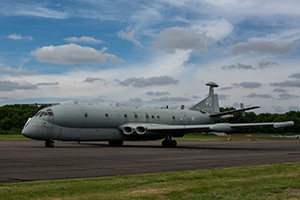 The Nimrod was also moved into position ready for its performance later in the day. A wind-damaged rudder would ultimately prevent a fast taxi but it is still a spectacle hear it’s mighty Rolls Royce Spey engines kick into life. 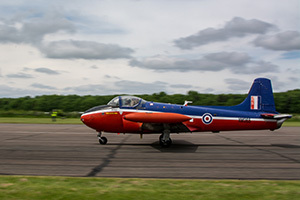 There were further figure of eight demonstrations and fast taxi’s from English Electric Canberra, ‘Treble 3’ and two Jet Provost’s before a paired run from the Iskra and Delphin. Sadly the later was unable to complete its fast taxi despite the best efforts of the pilot. Once again demonstrating how frustrating it must be for the army of engineers and volunteers who maintain these aircraft. 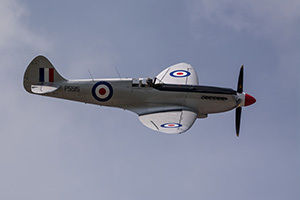 Today’s only flying item was the flypast by the Battle of Britain Memorial flight, who sent their newly refurbished mk19 Supermarine Spitfire which glistened in the sun as Squadron Leader Mark ‘Disco’ Discombe put it through its paces along the crowd line.The BBMF always offer a stirring tribute to the sacrifices made during the 2nd world war ‘lest we forget’. The last three demonstrations provided a reminder of the incredible engineering of the British aircraft industry during the cold war. 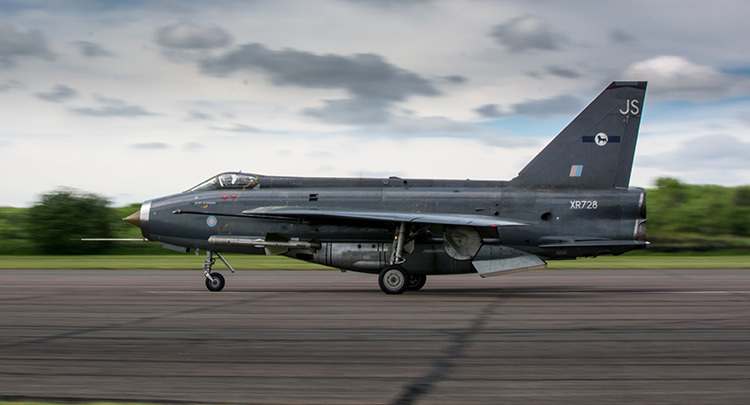 We were treated to fast taxi’s from the English Electric Lightning whose double afterburners were the loudest of the show (setting off yet more car alarms). 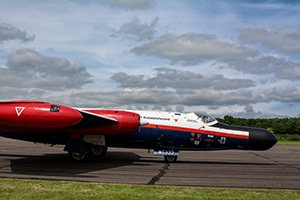 We were also treated to two Hawker Hunters also and the star of the show, the Handley Page Victor. The aging V bomber having recently marked the 25th anniversary of the Black Buck raids was fittingly piloted for today’s run by Falklands veteran Bob Tuxford. 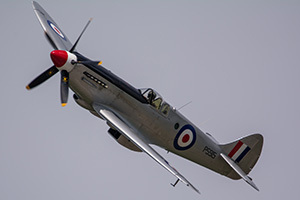 With a notable absence of classic jets flying in the airshow season this year, it is worth noting that this is the only place where such a wide range of classic British aviation engineering still lives and breathes on. Although operation issues, serviceability and the absence of the usually present large model aircraft meant today was not as fast paced as usual, it still provides a unique and thrilling experience.